The best DAB radios all in one place! What's the best DAB radio for you? No matter how many years go by – or how many newer, better-sounding audio standards come into vogue – the good ol' digital radio is still going strong. DAB radios make great gifts for that person who's difficult to buy for, or who doesn't necessarily care about the difference between FLAC and MP3. But the sheer variety of DAB radios available on the market by now can make finding the right one a pain. To save you the trouble, we've taken the best DAB radios in the country and rounded them up into a single unified list. So whether you're looking for a good digital radio for the kitchen, something for the bedside table, or a radio you can take on the go, we'll have the best option for you – whatever your budget. Here are the 5 best DAB radios available in the UK today. The build quality in the Revo is truly excellent, and so is the sound, though it's how Revo has addressed the needs of real people in real rooms that we like most. The touch-snooze feature, the volume dial and Bluetooth are all brilliantly convenient, though we reserve most praise for the use of an OLED screen that keeps the bedroom dark. The OLED screen uses some great-looking typography, too. Its headline slot and aux-in are handy, while the sound quality is thoroughly decent. But Bluetooth isn't exactly an expensive technology and the sound quality isn't perfect enough for Tivoli to be charging the kind of money it's asking for the PAL+ BT. The design has, however, smartly improved over the past few years, shrinking the remote and ditching the oversized analogue knob for a more capable LCD screen. 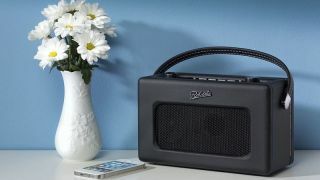 The Tivoli's PAL+ BT isn't the most cost-effective way of getting a DAB+ radio, but it is still one of the best out there. In the end, this is a compact, versatile DAB radio that can be taken around the home (and anywhere else) quite easily thanks to a 16-hour battery – while the PAL+BT's inclusion of Bluetooth and a bass-heavy sound goes some way to justifying its high price. Perfect for occasional forays into the bathroom. Do you need wireless charging? It has a lovely sound, with simple customization options and presets, while all the practical alarm, timer and radio functions of Pure's popular Siesta range position it as a hugely practical bedside gadget. Not to mention an auto-dimming LED display and dashing glass screen. Not everyone will make use of the wireless charging feature: but either way you're getting a sleek, well-designed DAB radio and speaker that's well worth a look. The price might be a tad high for some, but there's no doubting the top tech going on inside this product which is absolutely one of the best DAB radios we've tested.